Valentine's Day or Walentynki (vah-len-TIN-kee) has been observed in Poland since the collapse of Communism and the opening of Poland's borders. Poles were quick to adopt Western-style celebrations of Valentine's Day and nowadays it's as popular in Poland as anywhere else. Greeting cards and heart-themed gifts abound at gift shops and hotels, and resorts and restaurants offer special packages for romantic getaways. Many Poles make a romantic pilgrimage of sorts to Chełmno, a small town about 30 miles northwest of Lódz along the Ner River, a tributary of the Warta River in today’s west-central Poland. It is here that the relics of Saint Valentine, the patron saint of lovers, have been preserved for several hundred years in the local parish church. Dubbed "the lover’s city" or miasto zakochanych (mee-AHSS-toh zah-koh-HAH-nik), couples visit Chełmno to pray to the saint for a happy marriage. Gifts are exchanged between lovers -- cards, flowers, perfume, chocolates, jewelry, lingerie, and heart-shaped cookies known as ciastka w kształcie serca (CHASST-kah vef ksh-TAHW-cheh SERR-tsah) for the women, and electronic gadgets, DVDs and colognes for the men. The main square becomes a virtual fairyland when a huge electronic heart is lit to glow in the night. The festivities end with a glorious fireworks display. Opened on Sept. 30, 2010, the Father Bernatek Footbridge (Kladka Ojca Bernatka) spans the Vistula River linking the Kraków districts of Kazimierz with Podgorze. Hundreds of locks are attached to the bridge, put there by lovers who then throw the keys into the Vistula River as a sign of their commitment to each other. The locks are typically engraved with the names or initials of the lovers who put them there. 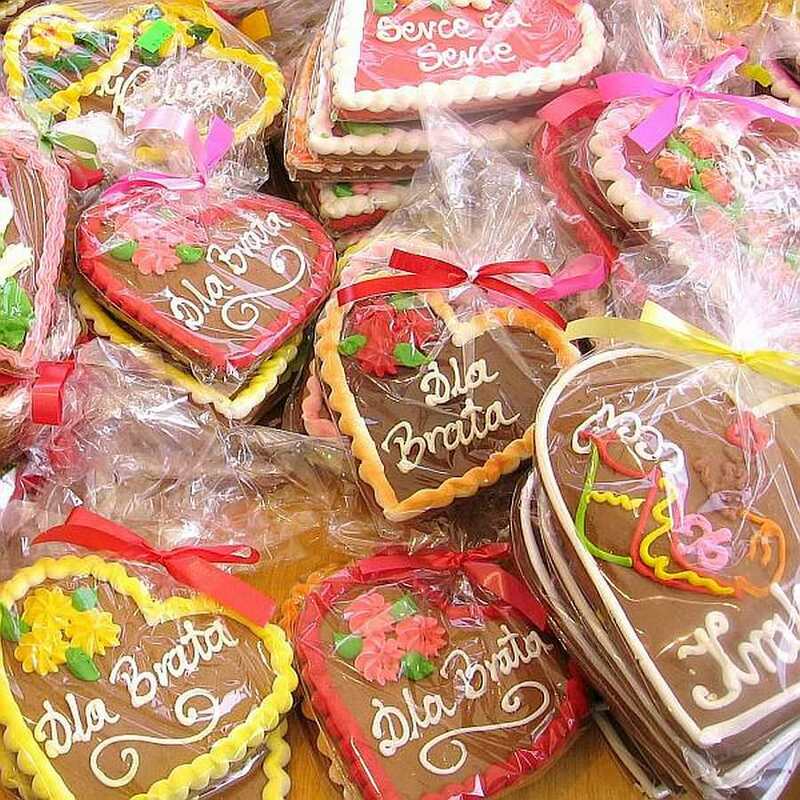 While Valentine's Day is celebrated more privately between lovers in Poland, Women's Day or Dzień Kobiet (JEEN KOH-byet) is celebrated nationally on March 8. Women’s Day was created in 1948 by the Communist government, in part, to replace the Roman Catholic feast day of Blessed Wincenty Kadłubek, a 12th-century monk, but also to glorify the ideals of women as hard-working contributors to the economy -- sort of a women's equality day. Although initially this holiday was enforced by the government, it became accepted and part of Polish culture, and is still celebrated as a national holiday for all women, regardless of age. They receive special attention, usually flowers, sweets and small gifts, not only privately, but at work and schools. The Western trend of giving greeting cards is creeping into this holiday as well. Guarantee a spot in your lover’s heart with this Easy Chocolate Mousse Recipe that can be prepared in 15 minutes but takes several hours to set up in the refrigerator. It is niebo w gębie (NYEH-boh veff GEHM-byeh) or "heaven in the mouth." Another sure-fire way to please someone is with this Polish Chocolate Cloud Torte Recipe. Wszystkiego najlepszego z okazji Walentynek (fshts-KYEH-goh nigh-lep-SHEH-go zih oh-KAH-zee vah-len-TIH-nek) or Happy Valentine's Day! How Do Polish Families Celebrate Easter? How Is St. Nicholas Day Celebrated in Poland?